Lucrezia and Cesare's theme on the harp (from the original The Borgias soundtrack by Trevor Morris). The celebrated 25-year-old French harpist Maïa Darmé, who has been fascinated with the instrument since the age of 6 and wrote her first composition for harp when she was 19, doesn't spend all her time playing in prestigious concert halls that offer a safe environment and flawless acoustics. Though she has already played on five continents and been taught by the world's leading harpists, including the world-famous Australian Alice Giles, Maïa's work also has other, less conventional aspects. 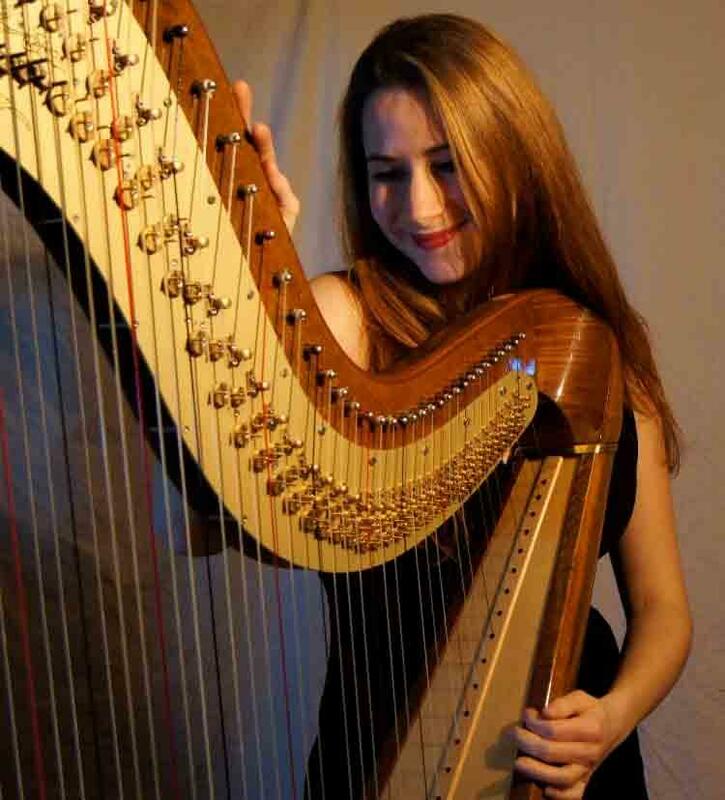 Maïa Darmé is currently transcribing Arab and Amazigh (Berber) music for the harp, which has never done before. "I recently travelled to Libya, where I studied traditional Arab and Amazigh music for several months. I had the feeling that Arab and Amazigh music would sound great on the harp. I thought it was a shame that no one had ever explored this potential repertoire. The harp is an incredibly flexible instrument and the more I looked into it, the more I realized that it worked perfectly. I improvised and performed with local musicians and took classes of oud and qanun, the two traditional instruments that are most closely related to the harp. I hope to publish arrangements soon to make this music accessible to the harp community." In South Sudan Maïa performs regularly with traditional singers of Dinka and Equatorian tribes, but she also plays more modern music, for instance with X Wine, a rising hip-hop star in the country. Maïa loves her work - making music, helping people and finding inventive ways of sharing musical styles. This variety makes her much more than a run-of-the-mill classical harpist. Her three-month UNICEF mission to South Sudan is not an experience everyone would like to share. Half the country is under the control of rebel forces. In the interests of safety Maïa does not venture into this danger zone. She also has to contend with the poor quality or complete absence of transport infrastructure, and the fact that large areas have been under water due to the floods of the past few months. Furthermore, there are hardly any music schools. Nevertheless, Maïa went there with her bardic harp, which she not only played in the capital Juba, but also travelled around the countryside like a troubadour, undeterred by the difficult conditions she encountered. "I arrived here at the beginning of September," says Maïa, "and will remain here for three months. It is a huge country, but half of it is in a terrible state and rather inaccessible at the moment. I am going around with my harp performing everywhere I can:I mostly play in schools and I teach in Juba, the country capital. UNICEF's aim in this project is to support the Ministry of Education in South Sudan, which is the newest country in the world. It is the last country to have become a Member State of the United Nations, on 14 July 2011." "The educational system needs a lot more support. Music classes for instance are part of the official curriculum, but in reality even in areas where schools are functional the lack of teachers and instruments gets in the way. There are only a couple of music schools and very few children are able to take private lessons. I am visiting many schools, to introduce the harp and teach basic music theory. I am the only person in the country who owns a harp, so obviously it is going to be very hard for students to continue learning the instrument when I have left. I also improvise a lot with local musicians I bump into, and learn a lot about the country's traditional music in this way. South Sudan is a country with a variety of completely different musical cultures and languages. I hope to take all my experiences back to Europe and spread the music around." "I go where music is most needed"
"I enjoy being here. I am greatly honoured to have been given the opportunity to work with UNICEF. I studied International Relations as well as music at university and I have been on similar missions for other humanitarian organisations. That is why my profile was of interest to them. I feel that I am actually learning more than I am teaching in South Sudan; my time here has made me aware how much we take for granted. I have been so privileged all my life, being able to focus on my passion, to learn from amazing teachers and to play the harp for a living. But here I have to deal with obstacles all the time. It really makes you humble, and brings out the best in you. You always have to find ways to overcome difficulties. I very much enjoy going where music is most needed, where music makes a difference. Being able to travel as much as I do now makes me realise how fortunate I have been all my life. So I just want to give something back, in any way I can." 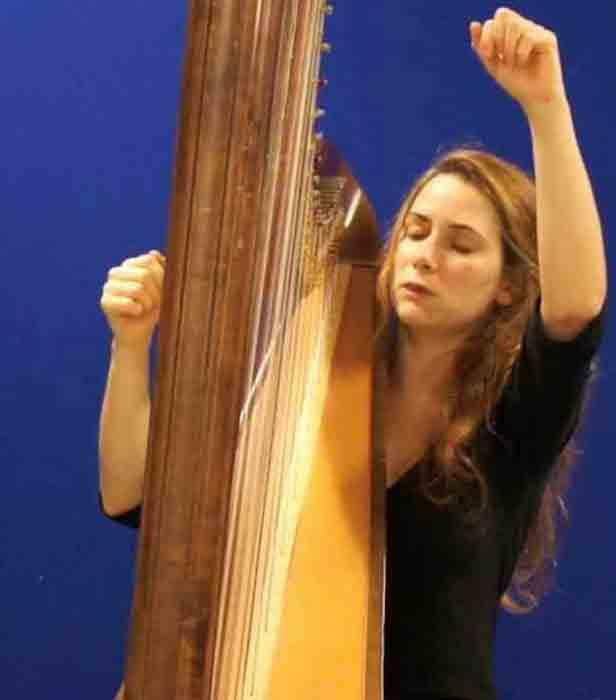 Maïa Darmé was born in Metz, in the industrial northeast of France, and has lived in many parts of the country - probably as many as the leading harpists who have taught her. Maïa grew up in a musical family: her father was an amateur singer, while her mother was a flute teacher. Maïa herself started off playing percussion and the recorder before she could try the harp, which she first played at a music school in Brittany. "I begged my parents for years to play the harp, but I think I was too small. They were not able to enroll me in a harp class till I was 6." She initially started playing the Celtic harp in Brittany, where it is very popular. The family then moved to the Vosges, and lived in Épinal for 3 years. She continued her musical studies there with Isabelle Coulon, a pupil of Elisabeth Fontan-Binoche - the world-famous harpist, who won the prestigious Prix d'Israel, the highest distinction for the harp in the world. Isabelle Coulon maintained very close links with Elisabeth Fontan-Binoche, who came to Épinal twice a year to give master classes which Maïa Darmé also attended. "I had this crazy imagination, I wanted to play things in my own way"
Maïa enthuses: "I studied for three years with Isabelle Coulon, who was my first classical harp teacher. She was fantastic. She taught me from the age of 6 to 9, and encouraged me to enter a harp competition in Paris, which I won. I was 9 years old and I had never been in a competition before. I had no clue what I was doing there really. I probably wasn't the easiest student to handle. I always insisted to play pieces beyond my level. I also had this crazy imagination, I liked to improvise and I wanted to play things in my own way." "My teacher in Bordeaux taught me to be a performer"
Maïa Darmé moved to Bordeaux when she was 10, and lived there for quite a long time. She went to secondary school there, and also took harp lessons from the age of 10 to 17, under Marie-Emmanuelle Allant Dupuy. "She was my teacher for seven years, and I learned a lot from her. She is very expressive, and her lessons were strongly focused on expressing yourself. She taught me how to be a performer, and made me aware of the theatrical aspects of a musical performance. She showed me how important it is to also be an actor on stage. A recital is theatre too, it's a complete performance." When she was 17, Maïa went to the Conservatoire Nationale de Région de Paris, where she studied for two years under various teachers. Then she won a scholarship to study in Australia, with Alice Giles. "That was absolutely incredible," Maïa says. "I felt blessed to get that scholarship and to be able to finish my Bachelor's degree with Alice Giles, who is one of the best harpists in the world. I studied one year with her and played in her Seven Harp Ensemble. She was a mentor on every aspect and helped me mature as a musician. Her teaching approach is very different from what I had been used to in France. I think it is more professional, more performance-oriented. She had a relatively small class and could focus on each harpist as an individual. She encouraged me to find my own voice. I was given freedom to explore many paths, and I realized it was OK to be unconventional. Alice Giles has a wide mastery of harp techniques. She is a complete artist, who can really create music out of pieces that many other harpists would look down on. She can basically pick any piece and make music out of it. She is incredibly musical." It was also in Australia, at the age of 19, that Maïa started to learn composing. She took composition classes at the Australian National University in Canberra, and later won a scholarship to study in New York, where she had classes in composition from George Lewis and Brad Garton at the Columbia-Princeton Computer Music Center, the oldest electronic music center in the USA. "It was a great place ," Maïa says. "Most avant-garde music composers, such as Edgard Varèse, Luciano Berio and Charles Dodge studied or worked there. It was a very good experience to focus on composing and bringing new music for harp to life." Maïa regularly experiments with jazz and improvisations, while her love of chamber music has led her to join many ensembles. She is also keen on performing in drama productions and with dance companies, and devotes as much time as she can to expanding the repertoire available for the harp. She had the pleasure of premiering many new pieces, and enjoys working with different composers - many of whom are relatively young like herself. She also took master classes with the French harpist Isabelle Moretti. Isabelle and Marielle Nordmann taught her the importance of breathing properly. "Whenever you play music, you must take the time to breathe, and know when to be silent," explains Maïa. "They taught me how to give space to my music. The harp is a very resonant instrument, so you really need to give every single note its own space. As a performer it is natural to be immersed in your music and we often feel the urge to keep on playing all the time, but you have to learn to step back, listen to yourself and take the time to breathe. It's all very well to play loudly, with lots of dynamics, to express all the emotions you want to share, but if you don't let the music breathe it all becomes overwhelming. It is the little breaks in your music that give it relief." Harp Cello Duo - Maïa Darmé - Liam Morrissey plays "Appalachian Swing." 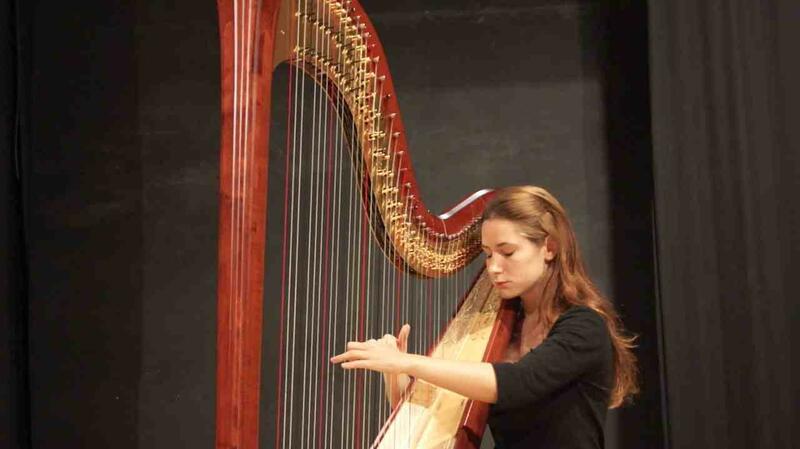 Maïa Darmé has also been the Principal Harpist of the National Orchestra of the Dominican Republic. She plays orchestra music and chamber music, in ensembles and gives solo recitals. She has also formed a duo with the cellist Liam Morrissey for some time; an example of their work is given in this video clip. Another unique combination in which she plays is a trio with two flutists. She forms a "Trio two flutes and harp" with Katell Guillemin Desfarges and her mother Myriam Darmé. The combination of a harp and two flutes is quite rare, while there are quite a few groups formed by a harp and a single flute. Maïa is happy with what she has been doing over the past few years. "Playing the harp is telling stories. Music makes us temporarily escape from reality and dream, but it is also a way of narrating very real experiences. Travelling to new countries, meeting new people, and telling their stories - that is really what feeds my music."